After three days of Autocad and hard work, Drexel and his wonderful, awesome, talented engineer step-father Al put this beauty together. Hopefully more photos and details of the construction will surface in the next few days. Right now we can shove two crash pads into the well in the back, and still fit five plastic bins under our bed. 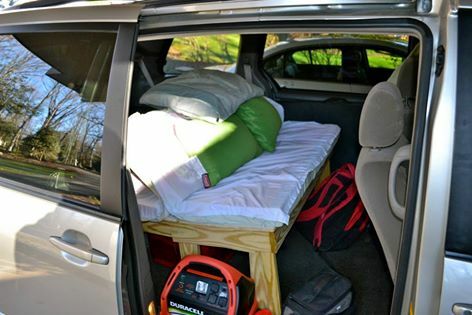 The Toyota Sienna is so perfect for living in, with so many built-in cubby holes and hidden pockets. 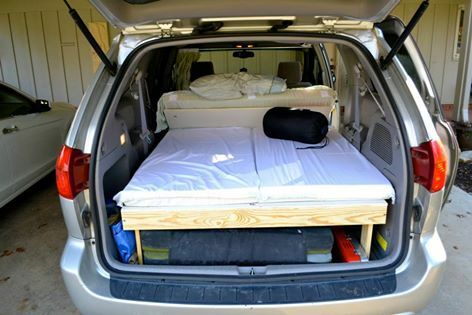 The front section folds up into a futon-esque couch, and the back pulls out to make a table for preparing food. We have a two-burner propane stove that makes water for oatmeal and tea in less than 5 minutes. If anyone has tips on how to improve our van-home, please comment or email!